This week, we cover the remainder of Oda Nobunaga’s rise to power: his wars for control of central Japan in 1570, his cleverness as a ruler, his brutal reign, and his eventual death at the hands of one of his most trusted retainers. A byobu folding screen of the Battle of Nagashino from a few decades after the fact. The Oda forces on the left defend against the Takeda coming from the right. This gives you some idea of the terrain and the path of Takeda attack. A Meiji Era woodblock print showing the last stand of Takeda Katsuyori in 1582. 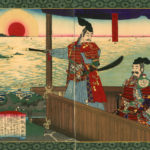 Katsuyori is on the right; he would commit suicide to avoid capture, but that would not save him from being disgraced posthumously by Nobunaga. 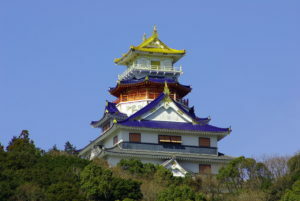 The original Azuchi Castle was burned by Mitshide in 1582; this reconstruction gives you some idea of its former glory. The expansion of the Oda clan during Nobunaga’s lifetime. 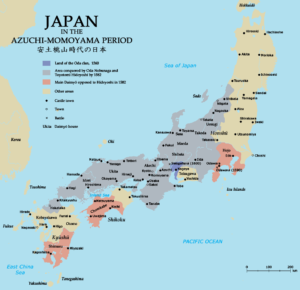 The Oda would never go on to rule Japan, but this territory would form the basis for Hideyoshi’s eventual reunification of Japan. A Meiji-era print of the attack on Honnoji. Nobunaga, on the right, is stabbed by an Akechi retainer. On the left, Nobunaga’s loyal page Mori Ranmaru attempts to save him. Kudos for not using the traditional narrative of the Battle Of Nagashino. One historical note is that the Nijo Palace built by Nobunaga for the Ashikaga is not the same structure/site as the Tokugawa Nijo Castle (there were actually five distinct Nijo Castles in Kyoto). Nijo Palace was dismantled after the Ashikaga were ousted and replaced by another Oda structure named the same that was largely destroyed in the Akechi attack on the Oda in Kyoto. The Tokugawa structure that still survives was built further to the west. A couple of other notes, Tedorigawa was a minor rear guard action involving less than 2000 troops total. 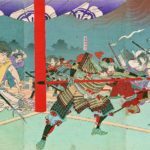 When the Japanese General Staff compiled their history of Japanese warfare in the 1890’s (in an attempt to establish a Japanese military tradition on par with those of the West), they greatly inflated the numbers (up to 80,000!!) and made up a glorious narrative. Actual contemporary accounts of the battle amount to less than a couple of sentences in the Shincho Koki and a brief mention in one of Kenshin’s letters. The Akechi/Hatano story about the retaliatory kidnapping/execution of Akechi’s mother actually comes from an Edo period kabuki play. 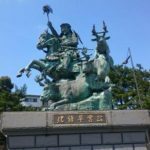 There are no contemporary accounts of this, and there are extant letters to Mitsuhide from his mother written long after the incident was supposed to have occurred. That’s the problem with so much of pre-modern Japanese history-outside of ledgers, tax documents, and the such, much of what is now accepted as historical fact is actually the by-product of Edo period plays and novels-or outright reimaginations of history designed to glorify the role of the Tokugawa (which is where the traditional narrative of Nagashino came from). I’m sure you run across that sort of thing all the time.